Other jades are optional but subject to availability. Each knife is made from one solid piece of jade including handles. Double the price for black jades. Triple the price for rarer jades. Ask for prices on finer gem grade material. Each chopstick is made from one solid piece of jade. Specify length, type, pattern, and/or coloration prefered. 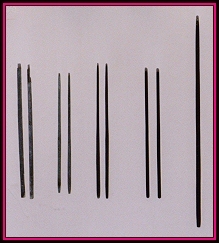 Indicate whether you want finished, rough and unfinished, or sawed only with flat sides. 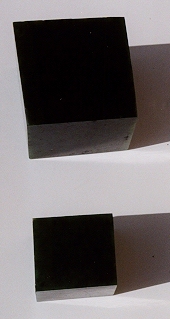 Each cubed block is made from one solid piece of jade. Specify size, type, pattern, and/or coloration prefered. Inquire about rough jade material. Many types, shapes and sizes are available. It can be sold by the piece or by the pound. Specify coloration, type and size. Some higher cost items are not already made. and one week for shipping. Add 75 cents per 5 pounds of weight for handling. over 150 pounds, FOB plus $15.00 for handling. Ask for costs for shipping outside of USA. We accept Cashier's check, Postal money orders. but allow 15 working days to clear bank processing. Make checks and money orders payable to "Jack Slevkoff"
We no longer accept credit cards due to credit card fraud and identity theft. We now accept payment via PayPal. PayPal charges a fee for this service. so it does not come out of the amount We are to receive. go ahead and make the payment. and have PayPal send it to you via your email address. and make payment accordingly for the amount We indicate. You do not have to be a PayPal member to make payment. Let Us know via email that payment has been made. We do not have any packages sent out until payment is received in full. for each increment of $100 being insured. If you want insurance, add these charges to your order. before items are sent out. any specials or discounts that apply. Common Law Copy Right 1996 1997 1998 1999 2000 2001 2002 Jack Slevkoff. All Rights Reserved.